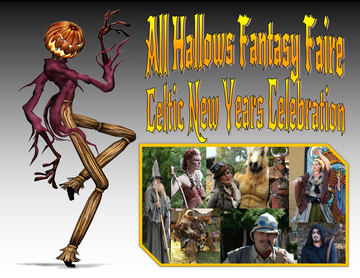 The Original 10th Annual All Hallows Fantasy Faire is a two day all inclusive costume play Celtic New Year's Celebration! Keeping the All-Hallows tradition this year we will have a magnificent fire show and The Burning of the Harvestman. The Faire is deeply rooted in the beliefs of the Celtic people, but combined with all the fun and excitement of a modern Halloween. Hundreds of visiting creatures and characters from your favorite fairy tales and Hollywood movies will come to life over this fun-filled family weekend! The faire offers many exciting venues to hear live music, enjoy themed food and drink, buy unique items, and marvel at jugglers and magicians. Wear your new or old costume and get into the fun and thrills of the faire! Music is always one of the favorites at the faire and this year will be more crazy& eclectic!